Regardless of whether you are in foreclosure, if selling your home won't net enough to pay off your existing mortgage(s), you may want to consider reasons for choosing a short sale. For many years, there were few reasons to take this route, apart from earning the real estate agent a commission, but times have changed. You'll hear the myth over and over: "Short sales protect credit." That's only partially true. Your credit will tank if you fall behind on your payments. Experts say agents who repeat that mantra without clarification do so out of ignorance or self-interest, take your pick. There's one exception, though. If you have no late payments — 60 days late or more — on your credit report, Fannie Mae might still offer you a loan to buy another home. However, most people who sell on a short sale are in default past 60 days, so this exception wouldn't apply. Agents get paid from the proceeds of a short sale. Agents don't get paid if the seller loses the home to the bank by going all the way through foreclosure. Even if the home never sells on a short sale, the agent gets free publicity (and new business) through signage, open houses, marketing and posting listings online. The home is still yours until the foreclosure is final, which could take months to conclude. The right of homeownership is stripped away. Homeowners usually have to return to the rental market. Your credit takes a nosedive, and a foreclosure will remain on your credit report for 10 years. Under Fannie Mae guidelines, without extenuating circumstances, you won't be eligible to buy another home for seven years. Of course, you will make your real estate agent happy because agents love new listings. But what about you? What do you get out of a short sale? You'll be eligible, under Fannie Mae guidelines, to buy another home in two years instead of five to seven years. If your credit report doesn't reflect late payments of 60 days or longer, under Fannie Mae guidelines, you'll be eligible to buy another home immediately. You may experience some of the same drawbacks as a foreclosure, but they might seem less intense. The derogatory credit item will remain on your credit report for seven years. A short sale could ruin your credit rating. It might not happen right away, but sooner or later, unless the bank has specifically agreed not to report the shortage, the bank may report it as a Score Factor Code 22. That score factor relates to delinquencies, derogatory records and collections. HAFA short sales for 2013 and later offer another option for sellers who are current. 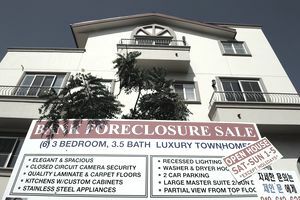 Real estate agents shouldn't give legal advice to clients facing foreclosure or assure sellers their credit rating won't suffer adverse effects. Those who insist on this practice may find themselves facing a process server down the road, and praying their errors and omissions insurance will cover them. For many sellers, though, the chance to buy another home in two years is the real motivation to do a short sale. Some sellers qualify immediately to buy again under certain terms. Good credit behavior can supplant bad credit after two years, even though the derogatory will remain.